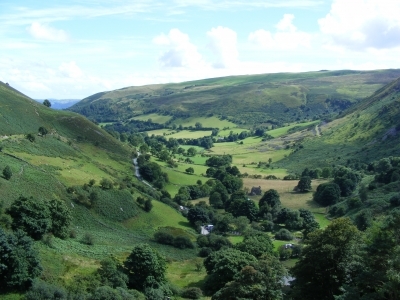 In the first post for “The Nanney Saga,” I presented a brief historical overview of the beautiful country of Wales. My Brackett Town neighbor, Wade Nanney, adds background to help us visualize his ancestral home. “Arthur’s throne remained intact through Rhodri Maur/Roderick the Great, who was the last king of all Wales in the 800’s. He had three sons: Cadell, Merfyn, and Anarawd. Thus, Wales was divided into three principalities: North Wales, South Wales, and Powys diagonally in between.” In the twelfth century, Cadwgan (of the Nanney line) was Prince of Powys. “He went up into the highest of the mountains and founded Nannau, which is an ancient term meaning “running water.” There are cascading mountain streams and waterfalls there. 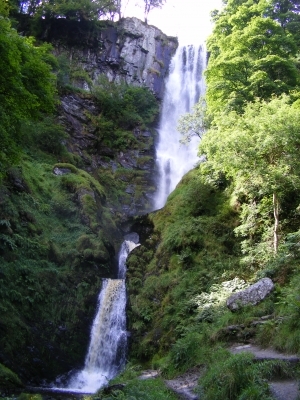 Part of the original estate is now in the renowned Snowdonia National Park.” The photo on the right is Pistyll Rhaeadr, about 240′ which is higher than Niagra Falls. Gwynedd County is in North Wales and adjacent to Powys, the Nanney family seat. An article at www.ancientwalesstudies.org/ speculates that the Nannau property was a land grant for service to King Gruffudd ap Cynan. There was certainly a history of armies on the move back then. After the Romans and the Anglo-Saxons, came the Vikings, Danes, French, Scots, English, Spanish, etc. Endless fighting over land they couldn’t govern. Rewards for loyalty. Sounds familiar. According to www.castlewales.com, the “brutal savaging of Llywelyn the Last” in 1282 and efforts to subjugate Wales under Edward I created turbulent emotions into the 14th century. Llywelyn ap (son of) Gruffyd was the last Prince of Wales seated on a Welsh throne. There were a couple unsuccessful native attempts to claim the title, but in 1301 Edward I seized the title with a military victory and gave it all to his own infant son. He had promised the Welsh the POW title would not go to anybody who spoke English. And it didn’t, because the baby only gurgled. There remains a tradition that the heir-apparent to the English throne holds the title “Prince of Wales,” i.e. the eldest living son of the King or Queen. (See Wikipedia Prince of Wales History) “The coat of arms of the Principality of Wales is the historic arms of the Kingdom of Gwynedd, used by Charles, Prince of Wales, on his personal standard.” It was first used by King Edward VIII in 1910. The POW also has a separate coat of arms for when he visits Scotland, which England also subdued. And he has a feather badge which for some reason has a German motto “Ich dien” meaning “I serve.” Special Note: He does not have a standard from the American Revolution. (Wikipedia: National Symbols of Wales). The 3rd Lord of Nannau (pronounced “nahn-NI”), was in the 33rd Regiment of Edward I and in a “high” Welsh marriage to an heiress thereby joining the estate of Hengwrt to their holdings. Their son, Ynyr Fychan (married to Gwellian daughter of a Gruffydd), was instrumental in 1295 in the capture of the rebel Madog ap Llywelyn who was hiding out in the Nannau back yard, the hills of Snowdonia. And their son, the 5th Lord of Nannau is still honored at the nearby Dolgellau church as a “mighty” knight who perished in 1350. (Another tour to plan: Dolgellau has become the administrative centre of Merionethshire where Huw Nanney served as High Sheriff in 1627. Its houses are built with the local dark igneous rock, and the gray little village with narrow one-way streets is walled in by mountains.) Two miles north east of Dolgellau, between two mountains, Moel Cynwich and Foel Offrwm, is Nannau. In an article by Thomas Richards (National Library of Wales): “Nannau for centuries was the home of the most powerful families in the county.” This certainly substantiates my neighbor’s declaration that his “ancestral home was originally the stateliest house in all north Wales, with a bell tower and 300 steps going up to it.” It lasted until cousin Owain Glyndwr’s army destroyed it. According to tradition, the 7th Lord of Nannau, Hywel Sele, was a supporter of the English crown. The reign of the new King Henry IV was highlighted by struggles over land ownership involving rich and poor. And this is where family politics turned ugly. This entry was posted in Nanney Saga, Setting and tagged Nanney family, Powys Wales, Snowdonia. Bookmark the permalink. Hi Nora, I think I need to plan a trip to see Wales, while I am checking out Ireland and Scotland. It would take a year, at least. So many places to visit.